This Paradive variant is the result of our effort to find the perfect modern alternative to the fixed bars found on the reference design. 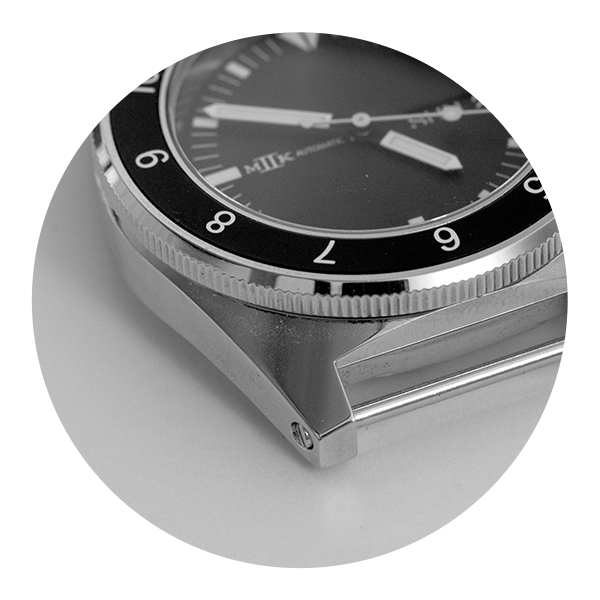 For this trial run we made 200 cases that utilize Seiko-style heavy duty 2.50 mm diameter spring bars. Available in all 6 variants (date and non-date and 3 different bezel styles), these will either be the first 200 of this type or the only 200 of this type. Regardless, they will be noted in our records as the first 200 ever of this iteration. The cases are compatible with the Seiko 2.50mm spring bars/straps and aftermarket spring bars/straps made to fit Seiko dive watches. This is the most secure method. However the pros end there. One of the biggest cons of this construction are limited strap options, which is why so many vintage military watch owners have tried to remove them with largely tragic results. We have always found the military watches that we have collected with this feature to be less comfortable than comparable watches with spring bars. The spring bars have a little give when paired with stiffer materials like NATO-style and nylon straps, making them more wearable. Finally the bars on some of the vintage watches we have handled have exhibited corrosion which raises the prospect of having to replace an entire case body because the fixed bars are rusting. We used these on the Sea Fighter as well the LRRP that we did a number of years ago. One of the reasons that we have not revisited this construction in the last few years is because of the difficulties of working with screw pins which include 1) limited aftermarket sources for replacements and 2) these are cumbersome to install and if done incorrectly they pins can unscrew themselves or become permanent (when too much or the wrong type of Loctite is used.) Lastly the screw pin is not much more comfortable than the fixed bar construction. We have had shoulder-less spring bars made to our specification so that we could offer most of the benefits of the fixed bar construction. Each of the standard Paradives and the Hawkinges ships with a set of our shoulder-less spring bars. These are a great alternative to fixed bars and they are compatible with all standard straps that are designed for the industry standard 1.80 mm spring bar. These have been purposefully designed to be very difficult to remove and conversely can be challenging to install. 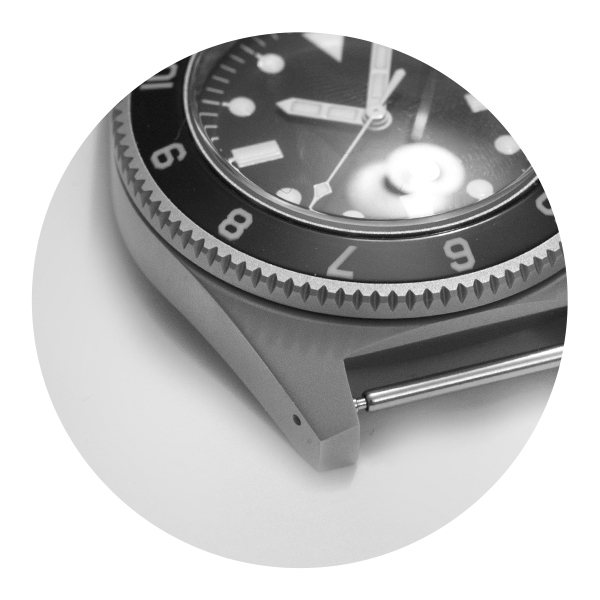 Ours are modeled after the type developed by Seiko for their ISO 6425 rated dive watches. We have admired these spring bars for years. They are incredibly secure and paired with drilled lugs as on the Paradive they are easy to remove. The "Fat Bar" spring bars on the Paradive can be removed with a paper clip and installed with the back of a thumbnail. In other words you don't actually need special tools to work with the "Fat Bar" spring bars. In the past the one downside is that the 2.5 mm diameter "Fat Bar" spring bars aren’t compatible with every 20 mm strap available, such as our Swiss Made rubber straps. Thanks to ToxicNATOs and their "SLIM Fat" spring bars, the "Fat Bar" Paradive is compatible with all standard leather and rubber straps. However if you prefer the added security of the purpose built "Fat Bar" spring bars companies like Worn & Wound, Uncle Seiko and Erika’s Originals offer a greater variety of options for this type of spring bar than at any time in the past. We think that this construction is perfectly positioned for wider adoption.